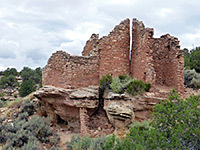 At just 14.1 acres, the Cutthroat Castle Group is the smallest of the six units of Hovenweep National Monument, and the northernmost, situated on and under the rim of an upper tributary of Hovenweep Canyon, south of County Road 10, in Colorado. Like all the five backcountry units, the place is remote and very little visited, receiving fewer than one group a day according to the NPS log book. 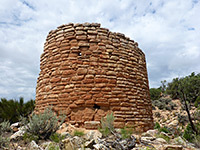 The group comprises four main Ancestral Puebloan ruins, inhabited approximately between 400 and 1300 AD; two circular towers, and a square tower adjoining several rooms, all these on the north side of the canyon, and another circular tower on the south side, together with several kivas and lesser structures, some unexcavated. All can be seen in about half an hour, and the walk from the parking area is short, 0.2 miles or less, though this is at the end of a rough track that requires a high clearance vehicle or even 4WD, so some people may have to park further away, perhaps along the paved road, 1.4 miles north. 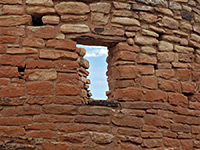 The ruins, which are well preserved, reflecting their high standard of construction, are similar in character to those at the main Hovenweep site, just somewhat smaller, fewer in number and set beside a shallower canyon. 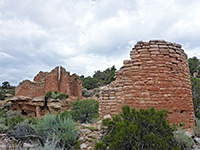 The structures here seem to have been discovered relatively late, in 1929, by archaeologist Paul Martin. Map of the area (within Canyons of the Ancients National Monument). 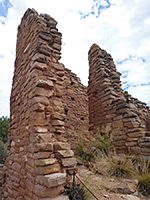 In common with the other backcountry sites of Hovenweep, Cutthroat Castle is not signposted from the main road. 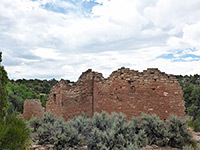 The dirt track that offers the closest access to the ruins forks southwards off Road 10, 3.7 miles east of the Utah stateline, crossing two minor drainages and reaching a junction after 1 mile, with a 0.4 mile spur to the parking area. 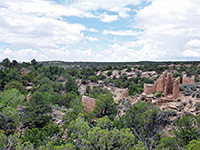 Past here the track continues, bending back north, the surface now somewhat better, and in another mile passes the trailhead for Painted Hand Pueblo in Canyons of the Ancients National Monument, then rejoins the main road 1.1 miles further. 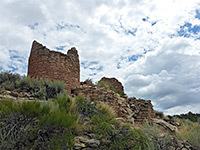 As an alternative to the rough western section of the track, some people drive to the Painted Hand trailhead then road walk to Cutthroat Castle (1.4 miles), while another option is a 0.7 mile path that starts along the track half a mile south of Painted Hand ('the upper trailhead'), and mostly follows the drainage that leads to the ruins. The 0.4 mile spur road, which looks as though it sees very little traffic, descends gradually over thin layers of greyish Dakota sandstone, passes a fence and gate, where a sign marks the start of NPS property, then ends in a small parking area, on a low promontory between two forks of the drainage. The ruins are due south, visible after just a couple of minute's walking along a well-defined path. 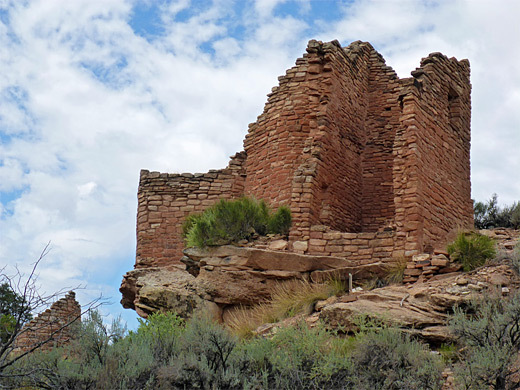 The largest site, the castle, is perched on the rim of an overhanging cliff; it has a square tower, a raised kiva (atop a boulder) and various walls from lower rooms, overlooking several smaller sites below the rim, including several more kivas. A short distance west are the remains of two round towers, one quite tall, the other low, while other main structure is to the east, on the far side of the drainage - another, less-tall round tower, surrounded by piles of blocks from unexcavated ruins. 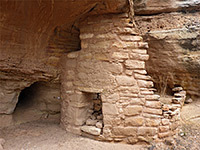 The relatively large number of kivas is one unusual feature of the site, as is the absence of any nearby spring, though significant water does flow down the canyon after rainfall, enough to sustain large cottonwood trees.